Three centuries later (15th Century BC) there was a cave-in at Mine-L, within the above mentioned area, and artifacts, tool, and a few inscriptions were frozen in time. This event provided knowledge of how much the Alef-Bet had matured in three centuries. 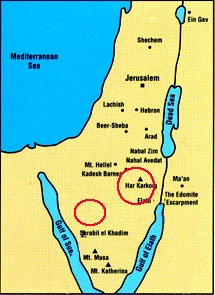 In the same century an area variation appeared in the Land of Canaan. This variation retained the archaic forms of Proto-Sinaitic and introduced a few abstract forms (used side by side with archaic forms). This area variation was called Proto-Canaanite. Both of these archaic scripts were the parents of Old Negev (1200 BC) an area variation found South of the Land of Canaan (an area that today extends from Beersheva to Eilat). Another script that emerged about the same time as Old Negev was Phoenician. Unlike Phoenician, Old Negev retained many of the archaic signs which they used side by side with abstract signs [the abstract signs were simply reformed Egyptian signs]. A study of the two parent Alef-Bets was an important step toward assigning the appropriate phonetic values to the Old Negev signs. Also since Old Hebrew was used as the best language to translate the two parent scripts it was logically the best language with which to translate Old Negev inscriptions. The geographical location of the emergence of Old Negev also favored a strong link to the parent scripts. In addition symbols, icons, and ligatures that doubled as icons and enhanced the meaning of the whole composition were consistently observed and they frequently included icons and phonetic signs that spell the most sacred name of the God of Israel [Yah, Yahh, & Yahu, which out of respect was never spelled out fully]. But all the above is just the beginning of the surprises that Dr. Harris describes in his book, The Name of God From the Sinai to the American Southwest. 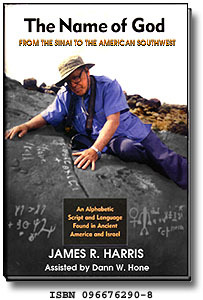 The real discovery was that this same ancient alphabet system was found on rocks darkened by patina (desert varnish), on paintings in caves and overhangs, with the same icon, ligatures, symbols, and the name of the same God spelled the same three ways in six Southwestern States. Prof. Harris has a corpus of I20 inscriptions from the Negev of Israel, and about 400+ from the American Southwest. It is indisputable evidence that a Canaanite people speaking and writing a Canaanite language and worshipping the God Yahweh found their way to ancient America. Dr. Harris is continuing his examination of the Israel site and has gained the interest of various international scholars in his Middle-East find.